The current version of Bokeh 0.12.10 broke some previous functionality for boxplots and required building a boxplot from the ground up. Unfortunately, the example code provided in the user guide colors each box based on the upper and lower boxes, rather than by the factor value. This example code instead colors by factor, and places the legend outside the bounding box. Full source code of this notebook is provided at: Bokeh Notebook Example. First, we import the required packages, primarily pandas and bokeh. Next, we create some sample data. Not the most interesting, but formatting by factor and value allows us to create the boxplot. # Generate some synthetic data. Now that we have some data, we first need a way to figure out how many colors we need. I wrote this convenience function to look at the data frame and figure out how many unique values are in the given column. Thus, we are coloring based on that column and pulling from the Spectral template built into bokeh.palettes. This function was adapted from the links provided in the code comments. treatment_col - column to use to get unique treatments. # Get the number of colors we'll need for the plot. # Create a map between treatment and color. # Return a list of colors for each value that we will be looking at. The full code for the boxplot creating is below. We first get the colors needed for the treatments, four in our case. Next, get the categories we will be plotting by. Quartiles and interquartile range are then calculated. ‘upper_source’ and ‘lower_source’ are ‘ColumnDataSource’ objects needed to create the upper and lower quartile boxes for the boxplot. They are essentially dictionaries but with additional features documented in Bokeh. Here we specify not only the treatment values, but also the colors that we will fill each box by. Outliers are then identified and kept in their own data source. The key insight of the Bokeh process is that the boxplot is built up by components, whiskers, vertical lines and boxes. Each of these calls is made using ‘segment’, ‘vbar’, and ‘rect’ calls. However, even though we have multiple treatments, by using the ‘ColumnDataSource’ objects, we are able to make one call to create a geom object for each treatment. Finally, placing the legend outside the plot requires a bit of wrangling. This new feature in more recent versions of Bokeh is not well documented. We must build the legend ourselves and then place it manually. This can be done in two lines of code. 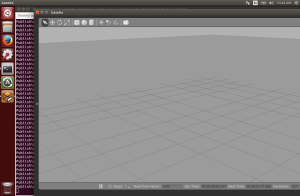 The first creates the ‘Legend’ object by using the ‘vbar’ return renderer saved in the ‘l’ variable. Combining this with the ‘ColumnDataSource’ provided to the original renderer, we create the legend with four values, each corresponding to a treatment. Finally, we add the legend to the plot manually. # Generate a boxplot of the maximum fitness value per treatment. # Get the colors for the boxes. # Get the categories that we will be plotting by. # boxes to be formed later. # prepare outlier data for plotting, we need coordinates for every outlier. # Using the newer autogrouped syntax. # create the legend explicitly. # Setup plot titles and such. 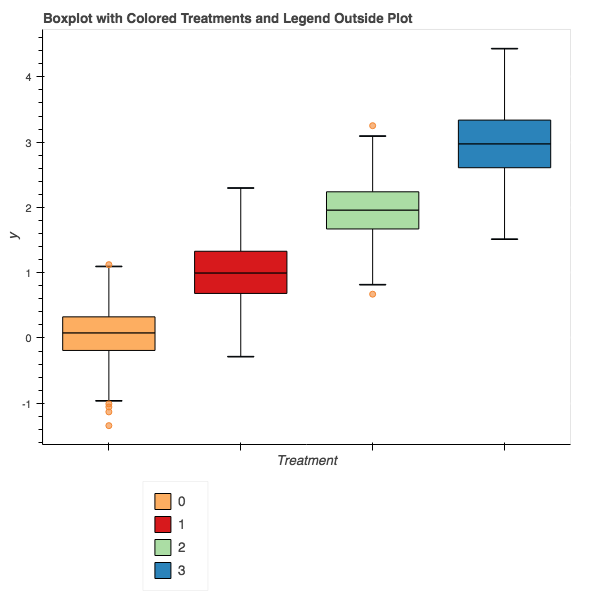 p.title.text = "Boxplot with Colored Treatments and Legend Outside Plot"
While perhaps not the most straightforward process compared to other plotting packages, Bokeh gives us the ability to build plots optimized for the web and additional features over just a static object. This code can of course be wrapped in a function and made part of a library, but that will be upcoming. This entry was posted in Bokeh, graphing, iPython Notebook, Pandas, plotting, Python, Visualization and tagged 0.12.10, bokeh, bokeh 0.12.10, boxplot, by factor, jupyter notebook, pandas, Python on October 26, 2017 by Jared Moore. Bokeh (https://bokeh.pydata.org/en/latest/) has been on my radar for some time as I move my data processing primarily to Jupyter notebooks. The look and feel of the plots have sensible defaults and generally are visually pleasing without too much customization. Compared to matplotlib, I find that I need to do much less customization to get my final product. Unfortunately, sometimes the process of generating a plot isn’t a one-to-one mapping with my prior experiences. One such area of difficulty recently was generating a plot with four treatments, coloring each group of circles independently. 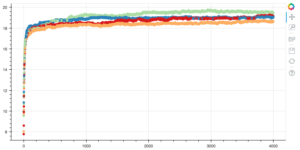 After much trial and error, the following code generated a rough plot I was happy with. # Create a map between factor and color. # Create a list of colors for each value that we will be looking at. The general process is to first get a color palette from bokeh.palettes.brewer. I selected the number of colors based on how many unique values existed in the Factor column. Then I created a map from the values in the column and the colors. Next, create a new list that maps each data point to a color, and use this when plotting using the circle call. You should get something similar to the following figure based on what data you have to import. Enjoy! Add color to your plots by factor! This entry was posted in Bokeh, graphing, Pandas, plotting, Python and tagged bokeh, color points, column value, Data Analysis, factor, plotting, Python on October 23, 2017 by Jared Moore. In my previous post, here, I showed how to create multiple instances of a worker for distributed computation. This works well for pleasantly parallel algorithms, such as genetic algorithms (GAs). 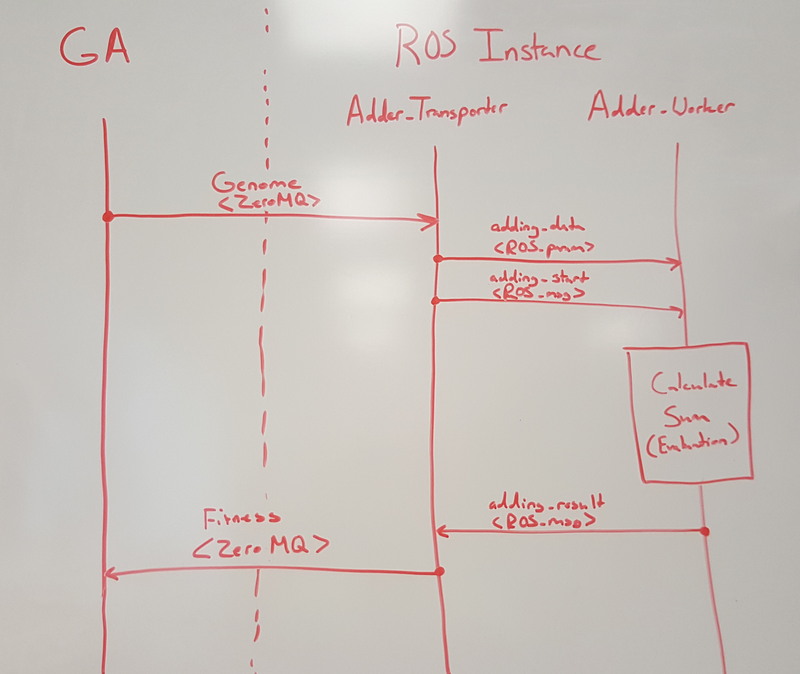 Unfortunately, it has taken me quite a while to write this follow on post as I ran into some challenging issues when moving from a simple adding service to ROS/Gazebo and robot simulation. Simple Roomba like robot with laser scanner in ROS/Gazebo. The Robot Operating System (ROS) and Gazebo work together to simulate robotic systems without the need for a physical platform. ROS itself runs as a distributed system of nodes, each handling one function of a robotic system (controller, sensors, actuators, etc). Typically, a ROS master is created in turn launching the nodes related to a robot, as well as a Gazebo node for conducting a simulation. 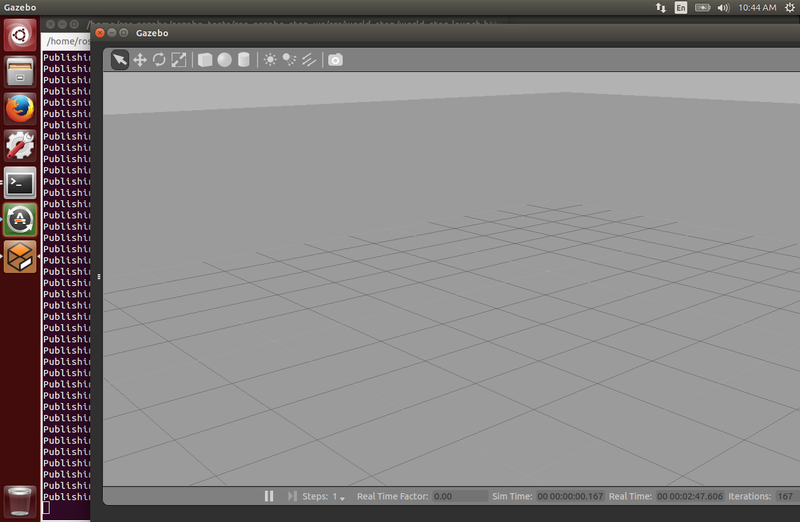 Under normal circumstances one robot/environment can be simulated at one time. This presents a challenge for GAs as we typically want, and often need for practical purposes, the ability to distribute simulations across many instances. This can be difficult to overcome as I have not found a way to launch more than one ROS master on a machine at each time. A few possible solutions exist. The simplest is perhaps spooling up multiple VMs with a GA sending genomes over a network connection and receiving fitnesses back from distributed workers. However, this has a potentially high computational cost as each VM will require a significant amount of resources. Another solution is to use the namespace tag within ROS to create multiple instances. However, this is not stable within every version of ROS. For this post, I am using code that works within ROS Indigo/Gazebo 7. Newer distributions of Kinetic should support this, but more discussion on the problem can be seen here and here. <node name="gazebo" pkg="gazebo_ros" respawn="$(arg respawn_gazebo)"
<node name="urdf_spawner" pkg="gazebo_ros" type="spawn_model" respawn="false" output="screen"
Note that some code has been removed for brevity. Full source for this can be seen here. Each component of the robot and plugins associated with the world are started within their own node. For example, the controller for this simple robot is in the turn_drive_scan node. A world plugin to control when a simulation is stepped is placed in the step_world node. All of these nodes exist within the default namespace of the ROS master. Adding another Gazebo instance would require duplicating these nodes with new names, perhaps basicbot_transporter_2, turn_drive_scan_2 etc. While this may appear to work, the issue arises when the nodes in a particular instance try to communicate with each other. By ROS convention, they use named channels, called topics, within the ROS master to pass information back and forth. Without custom names, collisions occur. The launch file specification provides a group tag to facilitate grouping nodes together. This allows for nodes to be placed in their own space eliminating the naming conflicts easily. Code for this can be seen below and is available here. <node name="gazebo" pkg="gazebo_ros" type="$(arg script_type)" respawn="$(arg respawn_gazebo)"
By wrapping the previous code in group tags, we have created two instances of Gazebo to run two robots in parallel in completely separate environments. What you may notice is that there is an extra line or two added above the Gazebo nodes just under the group tag. While most topics are automatically remapped to their own namespaces (“ga1”, “ga2”), the /clock topic is not. Without remapping explicitly, each simulation would publish and read from the shared /clock leading to problems when running multiple instances as the time in each simulation would move forward, and potentially backward! The line below the clock remapping is also required as by default Gazebo runs at the same default port. Each instance of Gazebo needs to be set to its own port address. <env name="GAZEBO_MASTER_URI" value="http://localhost:11346"/> sets a new port for a particular instance of Gazebo. Change the address accordingly for each grouped instance that you launch. After downloading the repository from here, run catkin_make within the base directory and launch the simulation by opening two terminals. In the first, launch the ROS master with the command: roslaunch basicbot_ga basicbot_ga.launch . Once the processes have spawned, in another terminal, navigate to the src/basicbot_ga/test directory and run: python non_ga_server.py . This will launch the process that distributes genomes to each instance of Gazebo. Remapped topics. Note the same topics repeated but prepended with the group tag. `/ga1/odom`, `/ga2/odom` etc. If you are curious, you can open other terminals, run export GAZEBO_MASTER_URI=http://localhost:XXXXX where XXXXX is the port of one of the groups. gzclient will then launch a GUI showing you the robot moving about the environment. You should see something like this if you launch gzclients for each of your groups. Running multiple instances of Gazebo within one ROS master using group tags and remapping. Grouping nodes with the group tag. Remapping clock explicitly for each group. Exporting unique ports for each Gazebo instance. This entry was posted in Uncategorized on May 15, 2017 by Jared Moore. Rather than employ the gazebo plugin from previous entries, all code now resides in one C++ file. We’ll declare both a ROS node to get the simulation time and report it to the terminal and also a gazebo node to actually handle the stepping of the simulation. Note: There are a few changes to the launch file in this example too so please use the accompanying world_step.launch rather than the version from previous posts. // Waits for simulation time update. // Publish the step message for the simulation. // Wait for 1 second and allow ROS to complete as well. As you can see from the code, we initially setup the gazebo and ROS nodes in lines 19-26. Lines 28-38 are similar to those of previous examples simply getting the current simulation time and printing it to the terminal. The main change from previous examples are in lines 40-47. Instead of waiting on a Gazebo plugin, this code implements the world stepping code directly in the while loop. The next two lines then simply wait one second before proceeding with stepping. With this setup, I now plan to use this loop to setup the basic framework for conducting simulations for a set amount of time. This entry was posted in ROS-Gazebo and tagged c++, cpp, Evolutionary Computation, Evolutionary Robotics, Gazebo, Robotics, ROS, ROS-Gazebo on April 1, 2016 by Jared Moore. After setting up controlled simulation stepping in a pure Gazebo environment (here), we’ll now move towards integrating the plugin in a ROS-Gazebo simulation. For this post, the codebase for the plugin is unchanged and only a few lines of code are needed to get this working. You can find the source for this post here. There are two tutorials I recommend reading through. The first covers the basics of using Gazebo plugins with ROS while the second provides a better overview of integrating Gazebo plugins with ROS. The code needed to integrate our plugin from the previous post requires the following insertion/modifications. These two changes should be all that’s needed to build the plugin from the previous example, provided you correctly move the world_step.cc file into this project of course. If all goes well, you should see something like the image below with the iterations and simulation time corresponding to each other and updating roughly every second of real world time. In the terminal where you called roslaunch you should see the repeating message “Publishing OnUpdate.” which is printed each time the simulation is stepped. 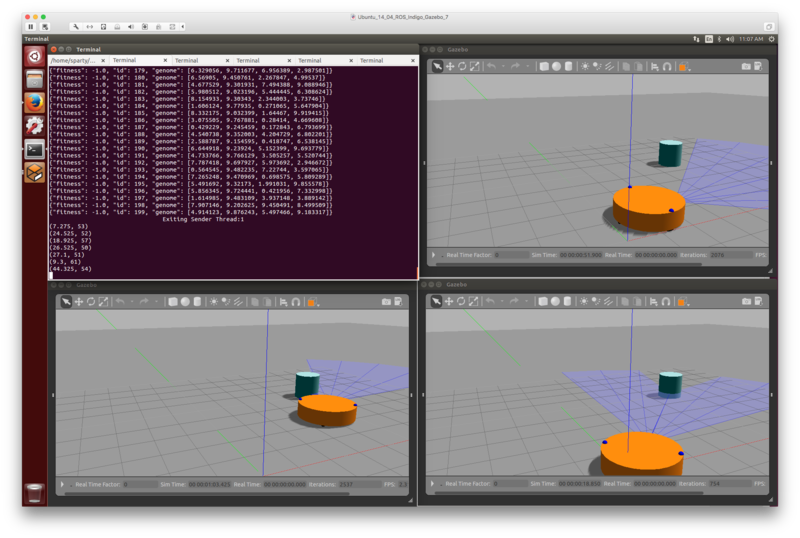 Adding the OnUpdate() call allows for stepping a Gazebo simulation while using ROS as well. The iterations, simulation time, and real time show that the simulation is being stepped once every second of real time. Now that we can step the world programmatically, the next steps are to integrate logic to start and terminate a simulation after a set amount of time and begin writing the evolutionary framework to launch many simulations. This entry was posted in ROS-Gazebo and tagged c++, cpp, Evolutionary Computation, Evolutionary Robotics, Gazebo, physics, Programmatic Stepping, Robotics, ROS, ROS-Gazebo, Simulation on March 24, 2016 by Jared Moore. The Robot Operating System, commonly known as ROS, (http://www.ros.org) is a framework for building robotics software. Rather than build each robot control system from the ground up, ROS provides a rich software environment with code submitted by many research labs around the world. 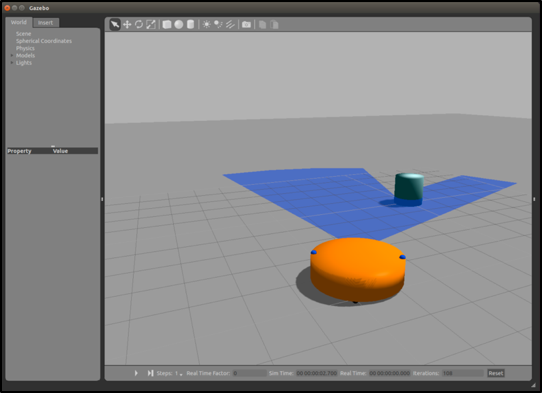 Gazebo (http://gazebosim.org/) is a physics simulation environment intended for use in robotics applications. 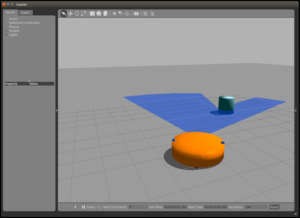 In addition to dynamics solvers, Gazebo includes functionality to visualize a robot or many robots while also interacting with the simulation through a GUI. Together, the two software frameworks allow for building robust robotic controllers and simulating their operation while freeing the experimenter from needing to build controller code from the ground up. The ability to add common controllers such as PIDs and prebuilt sensor packages are very intriguing, but getting started in this world can be a challenge. Evolutionary robotics adds another layer of complexity to the equation by requiring some perhaps not so common operations while running a simulation. From what I have seen, ROS is intended to act as a real-time controller for physical robots, and hence works asynchronously with either real or simulated robotics systems. That is, the controller does not necessarily update at well defined time intervals. This can be a challenge when doing evolutionary experiments as we want our work to be reproducible. The next two blog posts describe how to control the update frequency through a Gazebo plugin and then how to use that plugin in a ROS-Gazebo project. Code for the tutorials/snippets that I describe can be found at the following Github ROS-Gazebo-Examples. So, without further ado, I will now present the first snippet of test code that I put together to begin working with the two software frameworks. ROS and Gazebo operate as two separate programs running on a computer and communicate with each other through TCP/IP sockets and message passing. If left to run on their own, Gazebo will update at whatever rate the system allows given the hardware specifications and ROS will communicate through the sockets. However, there is no guarantee that communication will occur at any steady rate. This can make reproducing functionality difficult, if not impossible. The solution to this problem is to throttle the physics simulation. Within Gazebo is the concept of plugins that allow a user to insert their own code in a simulation to do many different things. An overview of plugins can be found here. I highly recommend reading through that before going through the rest of this post. Although plugins allow a user to write custom code for a simulation, I could not find a tutorial out there to actually write one that controls the stepping of a simulation. What’s needed for this is to write a publisher that throttles the rate of an update. While trying to search for an answer, the closest I found was a tutorial on changing the gravity of a simulation (here) and one for writing custom messages (here). With these two tutorials, I was able to come up with the basic strategy needed to make a stepping plugin. First, we need to pause the simulation from the start. Second, we need to step the simulation after delaying for some set amount of wall clock time. /// creating a new Node, and publishes messages to alter gravity. // Publish the initial message. // Called by the world update start event. From the above code, we first establish the plugin specifics in the Load function. There, we initialize a node and publisher for communicating with Gazebo in lines 20-27. We add an event listener (lines 31-32) connected to the world update end event to trigger our OnUpdate function each time the simulation updates. Finally, in lines 50-59, we setup the initial message to publish which pauses the simulation and sends a single step command. Thereafter, the OnUpdate function is called at the end of an update where we wait 1 second and then step the simulation again. By changing the value in the sleep function you can change how long between simulation updates. For now, the code simply steps the simulation after a given time delay. It may however be advantageous to connect the update to some predetermined events and shut the simulation down after a set amount of time. Look for those tutorials in future posts. My next post will cover integrating this plugin within the ROS-Gazebo framework. This entry was posted in ROS-Gazebo and tagged c++, cpp, Deterministic Simulation, Discrete Time Step, Evolutionary Robotics, Gazebo, Robotics, ROS, ROS-Gazebo on March 23, 2016 by Jared Moore. 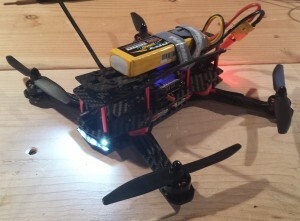 The finished ZMR250 build without FPV gear hooked up. The ZMR250 is a quadcopter frame in the 250mm size class. Compared to the popular DJI Phantom, the platform is significantly smaller, lighter and intended as a racing quad. After starting out with my RCExplorer Tricopter V2 build a few years ago, I kept my eye out for a quadcopter that could easily be packed inside a briefcase for portability. Being small and fast, the ZMR250 excels as an FPV platform for low, fast flying in an affordable and surprisingly durable platform. In the following post, I detail a few key lessons I learned and an overview of my hardware choices. This entry was posted in Multirotor, Quadcopter and tagged build, multirotor, naze32, naze32acro, quadcopter, zippy compact, zmr250 on December 9, 2014 by Jared Moore. My latest apartment doesn’t have a thermometer in it. So, like any good hacker, rather than buy a thermometer, why not build one? 7 segment LED displays can show one digit, but working with them can be a bit tricky. 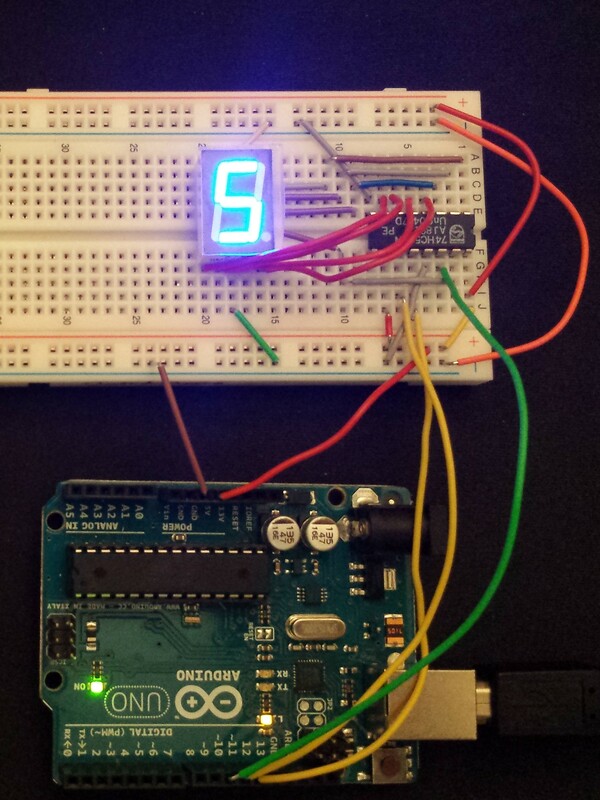 In this post, I’ll show you how to setup a single digit display with an 74HC595N shift register. 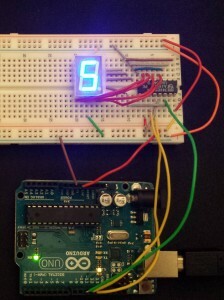 Arduino Uno connected to a 7 segment LED display through a shift register. This entry was posted in Arduino and tagged 7 segment LED, 74HC595N, Arduino, Arduino Uno, IS131, Microtivity on September 4, 2014 by Jared Moore. 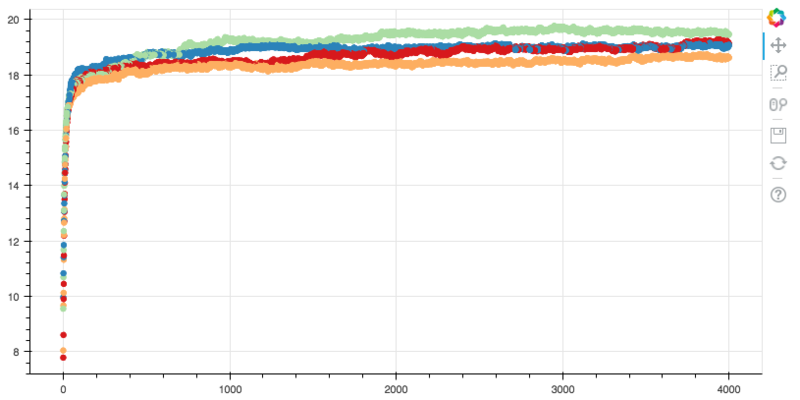 Evolution on the Web: What’s out there? These are notes taken during the Sandbox Session on Evolution on the Web at BEACON Congress 2014, August 18, 2014, at Michigan State University.